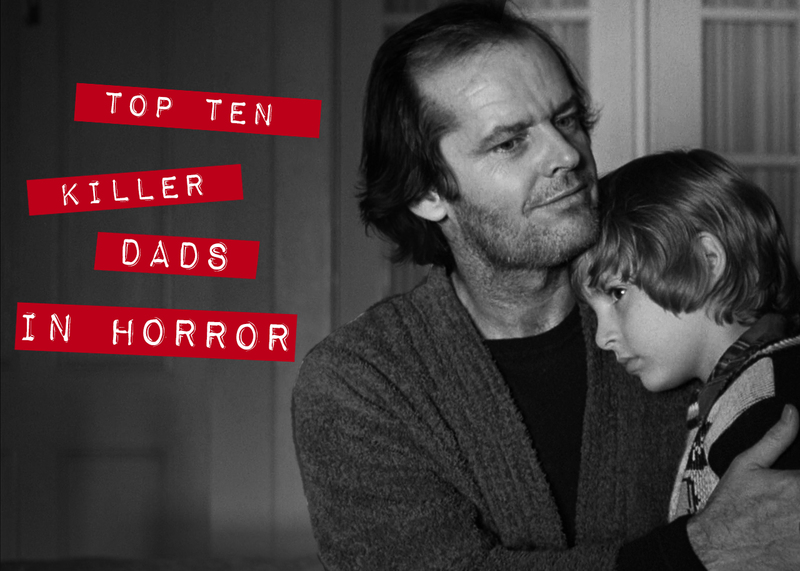 It’s Father’s Day, and we’re celebrating with a countdown of our top ten favorite killer dads in horror films. We recently celebrated our favorite killer moms in horror. Now it’s Father’s Day, and we can’t neglect to also honor our favorite deadly dads. So, in no particular order, here are ten of our favorite horror films featuring killer, creepy, or downright demented dads. Warning: There may be spoilers ahead. While some killer dads are just plain evil, others like Ed Harley in the movie Pumpkinhead are good men driven to very bad acts as a results of grief over a lost child. When Harley loses his son during a tragic accident involving a group of teens, he seeks revenge on those responsible. He visits a local witch who agrees to help Harley, but she warns that is vengeance will come with a terrible price. Blinded with grief, he still proceeds to help the witch conjure a demonic monster named Pumpkinhead. Although he later feels remorse for his actions, once Pumpkinhead is summoned he cannot be stopped. Perhaps one of the most famous fathers in horror is Jack Torrance (Jack Nicholson), a family man who takes his wife and young son to an isolated hotel for the winter, where he has secured a job as the caretaker. He hopes the quiet and isolation will give him a great opportunity to work on his novel. Unfortunately for Jack and his family, the hotel has other plans for him. An evil and spiritual presence influences the father to slowly go insane and try to kill his family, while his psychic son sees horrific forebodings from the past and of the future. Widely regarded as one of the best films of all time, this highly influential 1950s classic starring Robert Mitchum and Shelly Winters focuses on a corrupt reverend-turned-serial killer who attempts to charm a gullible widow in an effort to steal $10,000 hidden by her executed husband. But her young children are reluctant to tell her new husband where their real daddy hid the money. It’s based on the true story of Harry Powers, hanged in 1932 for the murder of two widows and three children in Clarksburg, West Virginia. Creepshow is a horror anthology, which tells five terrifying tales based on the E.C. horror comic books of the 1950s. One of the most memorable tales involves a daughter who murders her father on Father’s Day. However, a year later, the father returns for his cake and a little sweet revenge. Bill Paxton directs and stars in Frailty, a psychological thriller/horror film about a fanatically religious single father (Paxton) and his two young sons. The father believes he has been commanded by God to kill demons disguised as people. And, although he tries to be a loving and devoted father, his idea of good parenting involves teaching his kids how to catch strangers and chop them up with an axe. After murdering his entire family, a man remarries a widow with a teenage daughter in another town and prepares to do it all over again. This horror thriller features one of the most chilling opening scenes of all time. It’s loosely based on the life of mass murderer John List. This film was remade in 2009, but we strongly recommend you see the original. Don’t Go Near the Park was directed by Lawrence D. Foldes at the age of 19. The film gained notoriety when it was successfully prosecuted in the UK and placed on the video nasty list. It’s about a caveman brother and sister who have been cursed by their mother. In order to stay young, they are forced to prey on young people in the park and devour their entrails. After 12,000 years of killing, they attempt to lift the curse by finding a virgin’s soul they can sacrifice. The brother ends up fathering a daughter specifically for that purpose. The film also features scream queen Linnea Quigley in her first starring role. A young family moves into a large house, which also happens to be the site of a gruesome mass murder. They begin to experience strange manifestations and increasingly threatening paranormal activity, which drives them out of their new home. The ghosts begin to negatively influence the patriarch of the family, George Lutz, a stressed out dad who becomes increasingly angry and violent. The movie is based on one of the most famous alleged hauntings in history, as told by the Lutz family who bought a new home on 112 Ocean Avenue in Amityville, New York, a house where an infamous mass murder had been committed the year before. After the family moved into their new house, they claimed a series of frightening paranormal events occurred, forcing them to vacate the home 28 days later. In another example of a loving father turned psychopath, Eyes Without a Face is a classic horror film about a surgeon who causes an accident that leaves his daughter disfigured. In an effort to restore his daughter’s beauty, he goes to extreme measures — including murdering women and harvesting their faces. A cult classic, Spider Baby is a black horror comedy starring Lon Chaney, Jr. as Bruno, a chauffeur and caretaker of three orphaned siblings — the last generation of the inbred Merrye family, who have inherited a disease that causes them to regress into murderous savages. When distant relatives arrive with their lawyer to make a claim on the Merrye fortune, Bruno is forced to take drastic steps to protect the children. The film also stars horror icon Sid Haig. Happy Father’s Day to all the dads doing a killer job raising the next generation of horror fans!